The Amherst Veterans Memorial was developed in 2009 by the Town and the Amherst Veterans Committee to establish a permanent site to honor the United States Armed Forces and individuals connected to the Town of Amherst and the Village of Williamsville who have honorably served in the military. The Memorial is a place where family, friends, and the community can gather to pay tribute to the Armed Forces and those who should be recognized for their bravery, sacrifice, and service to our nation. The Memorial acknowledges our nation's five military services, Army, Marine Corps, Navy, Air Force, and Coast Guard and is flanked on both sides by granite panels where the names of individual veterans are inscribed. 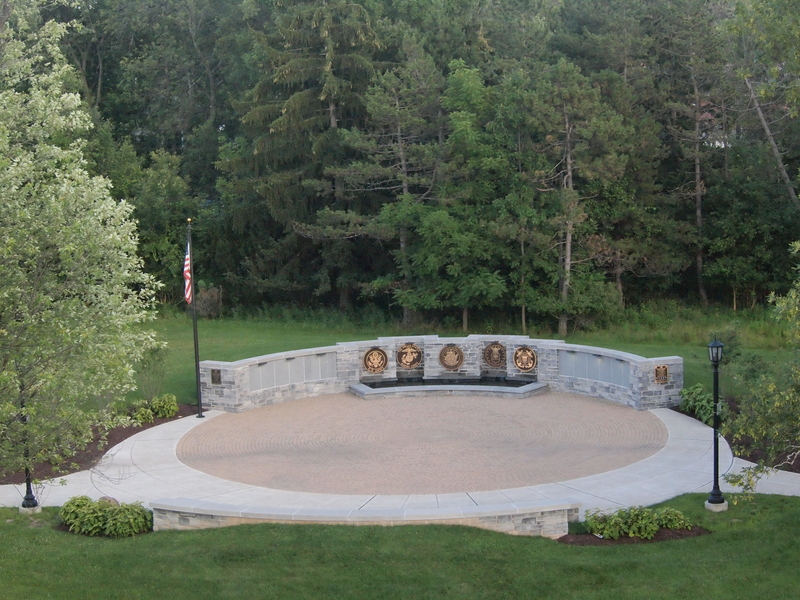 Located within the Amherst State Park, the Memorial is designed to be a peaceful and contemplative place, sensitive to it’s location within the Park while being respectful to our Veterans. Low stone walls set into a grassy knoll opposite the Memorial provide informal seating from which one can observe events or simply enjoy the Memorial and the surrounding landscape of the Park. Names of individual veterans may be submitted for engraving on the granite walls. New names will be added at an annual or semi-annual ceremony conducted by the Town Veterans Committee. Veterans and their family members and friends are invited to attend the ceremony. Click here for a brochure and contact information about having a Veteran’s name inscribed on the Memorial.